For years, Mike Commodore’s black briefs/red carpet photograph was the greatest NHL player photo that flaunted money, oozed comedy and offered unintentional fodder for those who see pro athletes as oblivious millionaires. This invention has its drawbacks. For example, NHL players are frequently out of contact with loved ones when their phones are placed into escrow during the season. Also, the owners are going to end up with a larger percentage of that phone by the end of the lockout -- Kane might lose the 9, 8 and SEND keys, at a minimum. It warms our hearts that Kane appears to be using a corded Thousand Dollar Ciz-ash Phone, as he looks down at the receiver. But in the future, perhaps Kane should opt for the Canadian Bluetooth, i.e., sticking a Loonie in your ear. Oh, yeah, right: This photo does absolutely nothing to cull sympathy for the NHLPA and its plight, despite the fact that it’s completely fine for a guy with a $31.5 million contract to goof around with stacks of money in Vegas. Just like it’s OK for a guy with a $24 million contract to show off his new car. It’s not a strike, it’s a lockout. The players aren’t the ones crying poverty. Check out this great new site called Cap Geek. It's not like they can hide their wealth, nor is it like Evander Kane tweets photos of himself swimming in a Scrooge McDuck Money Bin every week. Ah, but the photo, obviously, does nothing to help Kane’s reputation either, which was most recently maligned as an out-of-shape, uncaring KHL player. Remember when the Jets asked him to better manage his social media in light of rumors swirling about his behavior? Guy can’t catch a break. 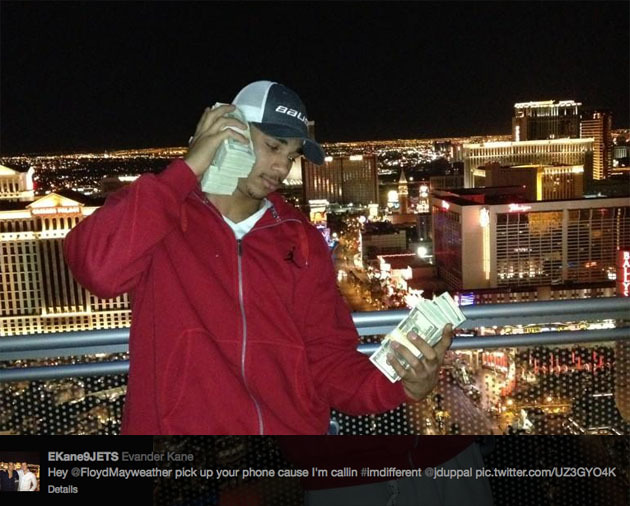 What kind of society do we live in where a pro athlete in his early 20s can’t use stacks of thousands of dollars to fake-call a boxing champion from a Las Vegas penthouse?